HOT CHOCOLATE IS DONE FOR THE 2018-2019 SEASON AND IS NO LONGER AVAILABLE IN THE SHOP, FOR DELIVERY, OR FOR CATERING. LOOK FOR IT TO RETURN IN FALL. ENJOY! simply made from scratch, our hot chocolate is available in a range of delicious flavors from traditional to unique. have a cup to-go from our shop, try a flight in the shop, or let us cater your next event. our hot chocolate is gluten free and can be crafted vegan upon request. mix-and-match ice cream sandwiches with hot chocolate or just sample our hot chocolates, it’s up to you! you choose the flavor of chocolate, use choose the toppings, we mix it up right in front of you, and you enjoy! perfect for groups under 100 people. each carafe serves 12 to 15 people. delivered hot and ready to drink in a recyclable carafe. includes everything you need for a pop-up hot chocolate bar - hot chocolate carafe, marshmallows, cookies, cups, and napkins. make vegan for an additional $4.99 per carafe. the perfect gift for those who enjoy camping, hiking, skiing, and snuggling on the couch. 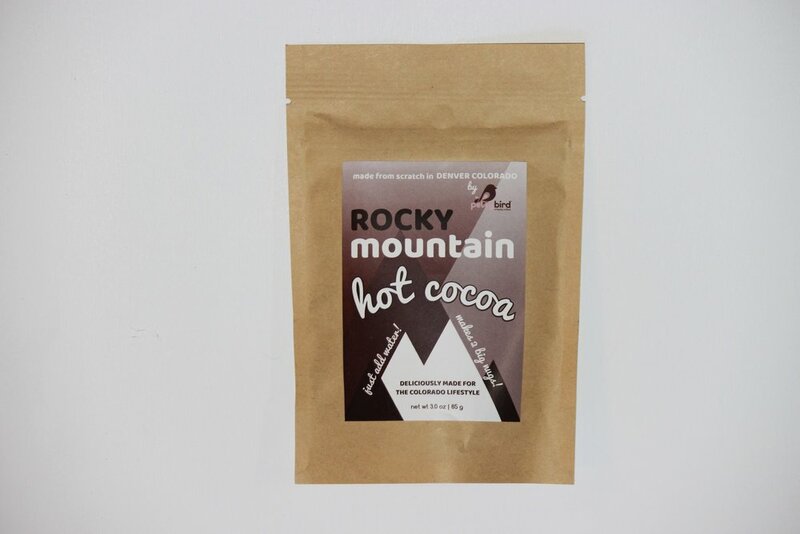 each pack includes enough mix to make 2 large cups of cocoa. why 2 servings? because, hot cocoa, like beautiful colorado, is an experience that should be shared. thank you for contacting peteybird. an enthusiast will respond as soon as possible. if you need immediate assistance, call us at 720.432.2430. enjoy!